Never again will you need to fertilize, mow, aerate or waste huge amounts of water to have green grass surrounding your home. However, this does not mean that artificial turf is completely maintenance free; to keep your synthetic grass looking its best and to get the most enjoyment out of your investment, you will need to perform regular cleaning and maintenance. Most homeowners will need to lightly rinse down their synthetic lawns once per week. Spraying down the grass fibers with a hose will remove dust and other small debris that has accumulated between washings. A more thorough synthetic grass cleaning, performed on a monthly basis, will help keep your lawn green, clean and inviting. To remove dust, dirt, leaves and other debris, use a flexible lawn rake, a broom with stiff bristles or a stiff brush. If you choose to use a stiff brush, make sure you do not choose one with steel bristles, which could damage the fake grass. Cleaning your grass in this manner is also an effective way to maintain the upright position of each blade. Keep in mind that you may need to perform this level of maintenance more often if you have pets or during seasons when trees and shrubs lose their leaves or blooms. Once you have thoroughly cleaned your grass, you may find that it is not standing as upright as you would like. You may also notice that your grass is not erect in certain areas after you, a family member or pet has lain on it. If you have moved into a home with artificial grass that has not been properly groomed or you have not been able to keep up with regular groomings, it is recommended that you have your lawn professionally groomed to restore it to its former lushness. To remove pet droppings from grass, simply use your preferred method for removing solid pet waste. This could be a plastic bag or a pooper scooper, for example. Once you have removed the solid waste, hose down the area in which the pet waste was located. Most pets have favorite places to relieve themselves, which makes pet urine removal simple as well. To ensure that your lawn stays clean and odor free, you may want to hose down your pet’s favorite urination area more often. It is also recommended that you keep a bottle of turf deodorizer handy, which will allow you to avoid lawn odors with quick, regular treatments of the area. Some pet owners choose to create a separate bathroom area for their pets in order to make fake lawn maintenance even easier. This could be a dirt or gravel patch in a side yard or other area. Dogs can often be trained to use these separate areas, making this a viable option for homeowners that do not want to clean pet waste from their synthetic turf. 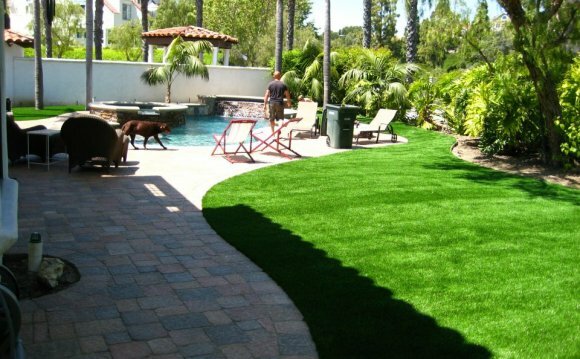 Keep in mind that this is not really necessary, since artificial turf is an ideal option for pet owners, particularly when compared to natural grass. Make sure to let your installer know that you have pets when you are making your installation appointment. When pets are involved, turf installation should be completed differently, including the addition of turf deodorizer to the base preparation, a recommended membrane between the base and the turf to allow enhanced air circulation and additional turf deodorizer on top with the installation of the infill. Lawns are meant to be lived on, which means drinks may be spilled, chewing gum or candy may be dropped, roughhousing may result in a bit of blood or mustard may drip from plates during a family barbecue. Artificial turf is stain resistant, which makes cleaning up spills and other accidents easy. Most spills can simply be rinsed away with water. If residue remains after hosing off the area, you can use a mild, natural soap with warm water or a half-and-half mix of vinegar and water, which is also a great option for removing bacteria. The key to effectively removing spills is to respond quickly. Spills are easiest to remove when they are still in liquid form and can be simply washed away. Chewing gum, candy and other sticky substances can usually be removed just by picking them up with your hand; however, if a piece of chewing gum is being particularly difficult to remove, you can chill the gum with an ice cube to make it easier to remove completely.